This section introduces some of the major figures in the history of Noh since the Edo era. Based on written accounts, we will trace their personalities and the arts which were written indelibly on the hearts of their contemporaries. Setting the Stage for Noh Restoration. A Master of Acting Technique. A Giant with Small Body. 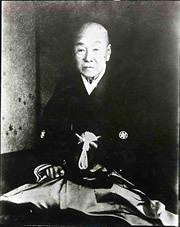 Famous Waki Actor who Established Meiji Era Noh.